West will be playing Arsenal later today and they have lunch an appeal on Lanzini's's ban. Lanzini was adjudged to have dived after what seemed like slight contact from Stoke city's defender Erik Pieters and won his side a penalty in West Ham's 3-0 win at Bet365 Stadium. West Ham has submitted written evidence to the FA today and their case will be heard by the independent commission. The outcome of the appeal will be revealed just a few hours before tonight's quarter-final clash against Arsenal at the Emirate stadium. 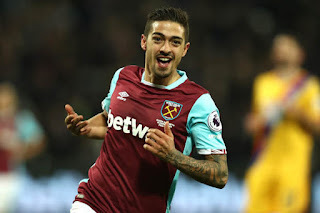 Should West Ham fail in overturning the charge, Lanzini would miss the important match against Arsenal, as well as this weekend's Premier League clash with Newcastle United. The FA statement said Lanzini was charged for "successful deception of a match official" and West Ham had until 6pm on Tuesday to respond to the charge. Stoke City manager Mark Hughes said: "Whether or not he is suspended or not, it doesn't help us." "He's clearly dived. He's a clever player, he'll draw a foul on some kind of challenge but he wasn't clipped." David Moyes said after the game: "Manu has ran 70 yards and probably ran his race at the end of it, I think the defender going to ground means the referee has a choice to make." "I don't think there's any intent regarding a dive. I think he's riding the tackle more than anything." "If you take the whole action into consideration, I definitely don't see it being a dive. I see it being tiredness at the end of it but I don't see a dive."